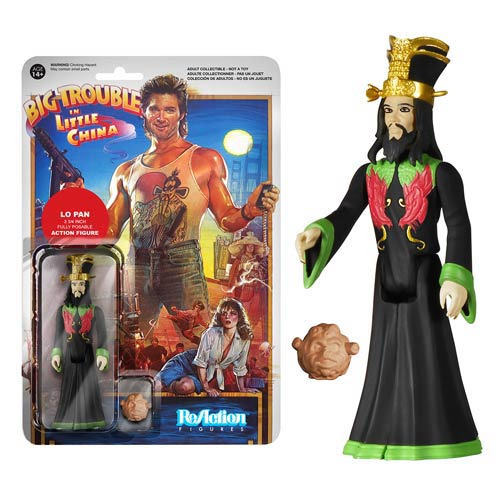 Shopping for Big Trouble in Little China Action Figures? Lo Pan from Big Trouble in Little China gets the ReAction treatment! Relive the epic adventure of bumbling trucker Jack Burton as he found himself in the middle of the mysterious underworld of San Francisco's Chinatown! As the evil head of Chinatown's underworld, David Lo Pan was actually an eternal soul trapped in an old man's body. Lo Pan abducts Wang Chi's fiancee to marry to regain his younger physical form. The Big Trouble in Little China Lo Pan ReAction 3 3/4-Inch Retro Action Figure is the perfect size for desk display at work or at home. Ages 14 and up.